Bijapur ST*, Valvi D*, Parulekar SV***. Broad ligament leiomyomas are the most common extra uterine leiomyomas, but the incidence is very low. They pose significant diagnostic and surgical difficulties. A case of a mesosalpingeal leiomyoma in a nulliparous woman is presented here. Leiomyoma is the most common tumor of the uterus and female pelvis. Among extrauterine leiomyomas, a broad ligament leiomyoma is the most common to occur; although the incidence is very low (<1%). Broad ligament leiomyomas pose diagnostic and surgical difficulties. These tumors are usually asymptomatic, but may result in chronic pelvic pain, compression of the ureter, bladder and the bowel with resultant dysfunction. We present a case of a mesosalpingeal leiomyoma. This is the first case of this type reported in the world literature. A 37 year old woman, married since 3 years, nulligravida, presented with a complaint of pain in lower abdomen for one year. The pain was dull aching, gradually increasing in intensity and decreased on taking non steroidal antiinflammatory agents. She had irregular menstrual cycles every 20 - 30 days, the flow lasting for 3 days, moderate and painless. There was no history of bowel and bladder disturbances. Her general and systemic examination revealed no abnormality. Abdominal examination show no tenderness, guarding or rigidity. Bimanual pelvic examination showed a 6-7 cm diameter, firm, nontender mass in right fornix in continuity with the retroverted uterus. Ultrasonography showed a right broad ligament leiomyoma measuring 3.8x3.5 cm and a right ovarian simple cyst measuring 3.5x1.5 cm. She followed up for surgery after 6 months, and a repeat scan done now showed an 8.5x9.1 cm sized right broad ligament leiomyoma with significant increase in size as compared to previous scan and a right ovarian simple cyst of 2.7x1.7 cm. Her investigations for fitness for anesthesia showed normal results. 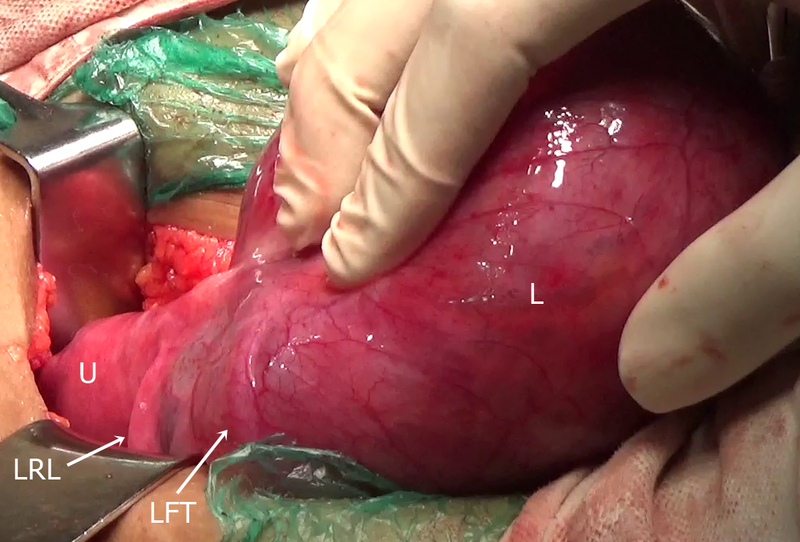 An exploratory laparotomy was performed with a plan to do a myomectomy and chromopertubation. 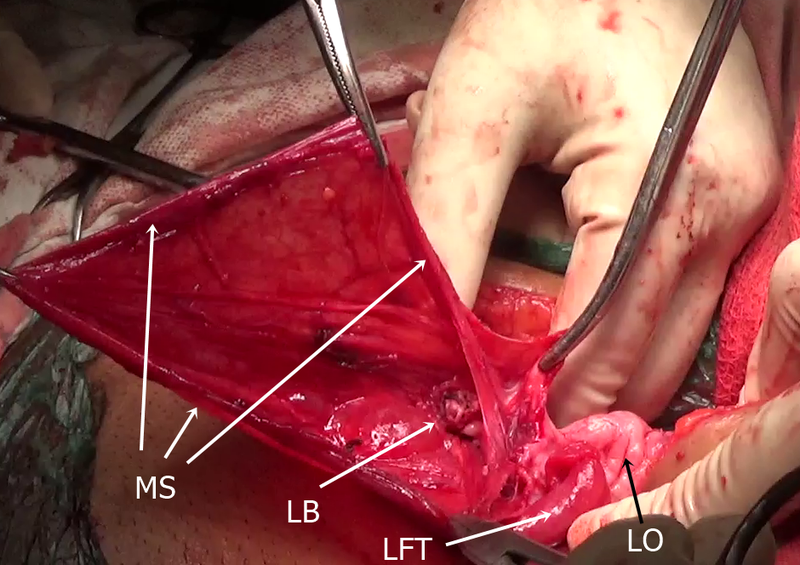 During laparotomy, a large mesosalpingeal leiomyoma measuring 10x12 cm was found on the left side, with left utero-ovarian ligament stretched posteriorly and left fallopian tube stretched anteriorly over it (figure 1). 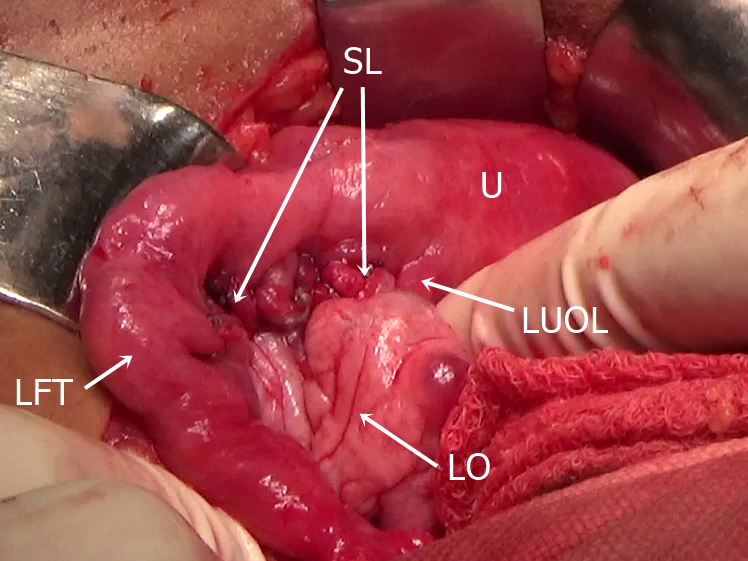 The ureter well below the mass. The uterus was normal in size and shape. The right fallopian tube and both ovaries were normal. An incision was made parallel and above the left utero-ovarian ligament and the leiomyoma was enucleated avoiding injury to the fallopian tube. Hemostatic figure of eight sutures taken over leiomyoma bed with No. 1-0 polyglactin. Mesosalpinx was reconstructed in continuous non-interlocking suture of No. 1-0 polyglactin. Transfundal chromopertubation done with methylene blue solution. Both fallopian tubes were found to be patent. She made an uneventful recovery from the operation. Histopathological examination of the tumor removed confirmed the diagnosis of a leiomyoma. Figure 1. 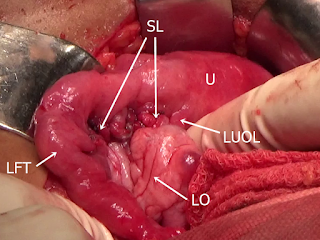 Intraoperative findings, anterior aspect: U – uterus, LRL – left round ligament, LFT – left fallopian tube, L – leiomyoma. Figure 2. Intraoperative findings, posterior aspect : LFT – left fallopian tube, LO – left ovary, L – leiomyoma. Figure 3. Stage of surgery almost near the point of removal of the leiomyoma: LO – left ovary, LUOL – left utero-ovarian ligament, L – leiomyoma, LFT – left fallopian tube. Figure 4. Stage of surgery after removal of the leiomyoma: MS - mesosalpinx, LB – leiomyoma bed, LFT – left fallopian tube, LO – left ovary. Figure 5. 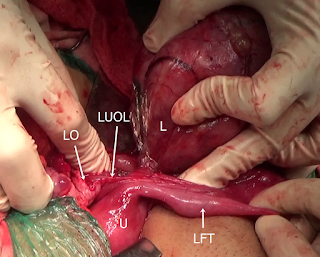 End result of the operation: LFT – left fallopian tube, LO – left ovary, LUOL – left utero-ovarian ligament, U – uterus, SL – suture line of closure of mesosalpinx. Leiomyomas are benign tumors of myometrium. Extra-uterine leiomyomas are rare, broad ligament leiomyomas being the most common among them, though their overall incidence is less than 1%. Broad ligament leiomyomas are of two types- false and true. True broad ligament leiomyomas arise from the muscle fibers normally found in the mesometrium, like the round ligament, utero-ovarian ligament and connective tissue surrounding the ovarian and the uterine vessels. These do not have a pseudocapsule and are associated with a greater risk of injury to the ureter, as it can lie medial, lateral, above or below the leiomyoma. False broad ligament leiomyomas originate mostly from the lateral walls of the uterus or cervix and bulge outward between the layers of the broad ligament. A false broad ligament leiomyoma usually lies above the uterine vessels, and hence the ureter lies below and lateral to it. A leiomyoma in the mesosalpinx has not been described before. It can be confused for a true or false broad ligament leiomyoma during a laparotomy. It can be diagnosed by presence of the fallopian tube stretched over its upper part, the utero-ovarian ligament and ovary posterior to but separate from it, and a normal broad ligament below it. There is not much risk of an injury to the ureter during removal of such a leiomyoma because it is not closely related to it. The fallopian tube can be injured during its removal, and caution is necessary to avoid such an injury. Hemorrhage is possible during its removal, from the branches of the uterine and ovarian vessels anastomosing in the mesosalpinx. Digital compression of these vessels in the mesosalpinx during the operation minimizes the blood loss. We thank Dr Neha Mathews for taking operative photographs. Te Linde’s Operative Gynecology 10th edition,Surgery for Benign Gynecological condition. Bhatta N. Tumours of the corpus uteri. Jeffcoats Principles of Gynaecology. 6th ed. London: Arnold Printers; 2001. p. 470. Parker WH. Uterine myomas: An overview of development, clinical features, and management. Obstet Gynecol 2005;105:216-7. Parulekar SV. Practical Gynecology and Obstetrics. 5th ed. Mumbai: Vora Medical Publications; 2011. p 348.